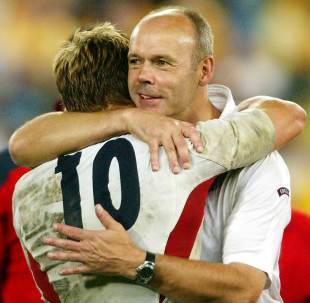 World Cup winning coach Sir Clive Woodward has paid tribute to Jonny Wilkinson following his retirement from international rugby. The legendary fly-half opted to call time on his England career on Monday following an incredible haul of 1246 points at the highest level. And Woodward, who guided England to World Cup glory back in 2003, will be forever indebted to the man who kicked the tournament winning drop-goal. "It is one of those days you never thought would come," Woodward told The Times. "It is surreal, really. As far as I am concerned it is the end of an era and it draws a line under the 2003 team. "I consider myself really lucky to have had him as a player. I first capped him as an 18-year-old. People talk about a model professional; well, he was the model model. He was just a great guy who worked so hard. Everybody in an England team, especially from 2003, would consider themselves fortunate to have played with him. "He was immense in every way." And Woodward's sentiments have been echoed by Damian Hopley, the chief executive of the Rugby Players' Assocation. "Jonny Wilkinson redefined the standards for rugby players in his extraordinary international playing career," Hopley said in a statement. "He has been one of the consistently outstanding world class athletes of his generation and you could not wish to meet a better role model. "His capacity for hard work, continual improvement and dedication has left a lasting legacy by which future players will be judged. On behalf of every RPA member, I would like to thank Jonny for everything he has done for rugby in England and we all wish him continued success for the remainder of his playing days in Toulon." Former England skipper Will Carling continued the tributes. "As an English sporting icon, Jonny Wilkinson deserves to be ranked right up there with our other World Cup-winning hero Geoff Hurst," Carling wrote in his column for The Sun. "Hopefully, it will not be more than 40 years before England win the rugby World Cup again. "But however many times we manage it, that first one will always be extra special. And the memory of Jonny landing that last-gasp winning drop goal in the 2003 final -- with his "wrong" right foot -- is one that will be savoured by Englishmen for as long as the game is played. "And I honestly can't think of anyone who deserves to be remembered with such fondness more than Jonny. His retirement announcement refers to the way he has "breathed, loved and embraced the game" for as long as he can remember. And that sums the guy up perfectly. "As well as being a World Cup winner, he has been a fantastic role model both on and off the pitch, a truly wonderful ambassador for English rugby. When people talk about sportsmen being squeaky clean these days, there usually seems to be a note of cynicism or sneering attached to it. "But Jonny's attitude, his commitment, his professionalism and his dedication deserve the highest praise."